Playing a musical instrument can be a very rewarding experience. Nonetheless, when you’re just starting out it’s hard to know how to find the perfect music teacher. The search may prove frustrating and daunting when so many teachers all say they have the best services. So how do you choose? Before you even start looking for a teacher ask yourself about the goals you plan on setting for playing your chosen instrument. Is this for fun and relaxation? Do you want to improve your skills? Are you interested in playing professionally? All of these questions impact your search for the perfect teacher. If you’re just wanting to learn a new skill you won’t need a world-famous musician teaching you. Professionally-driven education, however, requires a professional, accredited teacher with excellent student reviews. We at MusicProfs.ca are dedicated to helping you find the right teacher using diligently sought information that is focused on your goals and your needs. Another question that impacts how to find the perfect teacher is the kind of music you want to play. Reciting Mozart is a far cry from jazz style playing. That means finding a teacher that speaks the same stirring musical language and can help you learn the subtleties of it. Our database helps you with that too. The whole idea is to give you a variety of choices so you can locate the person with whom you feel most comfortable. Personality also plays an important role. If you think back to high school, there was always one or two teachers you either loved or hated. What were the qualities in the teachers you most admired? Those characteristics make a good starting point when you’re interviewing a potential music instructor. You want someone with patience, an upbeat attitude and the ability to inspire your efforts. Word of mouth is an excellent way to weed out the so-so teachers vs. those with excellent referrals. Bear in mind, however, that just because Aunt Mary plays the piano doesn’t mean she can teach, let alone recommend the perfect piano teacher. The review section of MusicProfs can make your job a lot easier. Once you’ve found a couple of potential teachers the next step is a face to face meeting. Come armed with all your questions, the first of which is where that person teaches. This is important because when a teacher shares space with others (like at a school) it’s possible to have lessons interrupted. Next, find out if the teacher has any ties to profession piano organizations. This isn’t a huge necessity but it does reflect on the teacher’s focus and experiences. This is also a good time to find out about their teaching methods, musical style, whether they ever have students compete and if they put on recitals. Competition can be a great way to stretch yourself, but that alone should not be the driving force for your teacher unless that is YOUR goal. This skill is supposed to be enjoyable, not drudgery. If practicable see if the teacher will give you a sample lesson. (Most teachers on MusicProfs offer free trial lessons) This is really the only way you’re going to get a feel for what this process is like, and the kind of working relationship you may build with the teacher. Many teachers also suggest signing up for only a few classes initially so that you’re not as financially invested if you’re unhappy. You can find much of this information upfront on our MusicProfs site, making the process much less chaotic or uncomfortable. 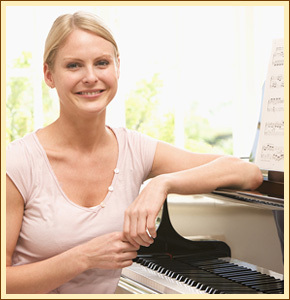 Fees for professional music lessons vary from area to area, check the teachers’ profiles for their fees. Most teachers charge by the month, but you can inquire about other arrangements along with the teacher’s financial policies for things like missed lessons. During your trial or first lesson, take a close look at the learning environment. A good studio offers quiet, good lighting, all the equipment you need for lessons, like a metronome and a well-tuned piano for example. It’s impossible to learn successfully on a sub-par instrument. Should a teacher begin making excuses for their studio’s condition, this is not the perfect teacher for anyone. If that teacher did not present that information on our site, please let us know. We are committed to quality. While at first you may not be sure how to find the perfect teacher, if you follow the tips and guidelines in this article and use the tools we provide at MusicProfs they’ll get you a lot closer to your goal. Once you play an instrument it’s an aptitude that stays with you, and one that many friends and family will appreciate. May you make beautiful music! MusicProfs connects aspiring musicians eager to learn how to sing or play a musical instrument, with quality music instructors throughout Canada. MusicProfs plants a tree for every new member? Learn more about our A Tree for Each Member initiative here.